Many people spend hours gazing wistfully at their grimy old tiles and dull fittings, dreaming of a better tomorrow. However, few realise that you don’t actually need to spend much to achieve it. 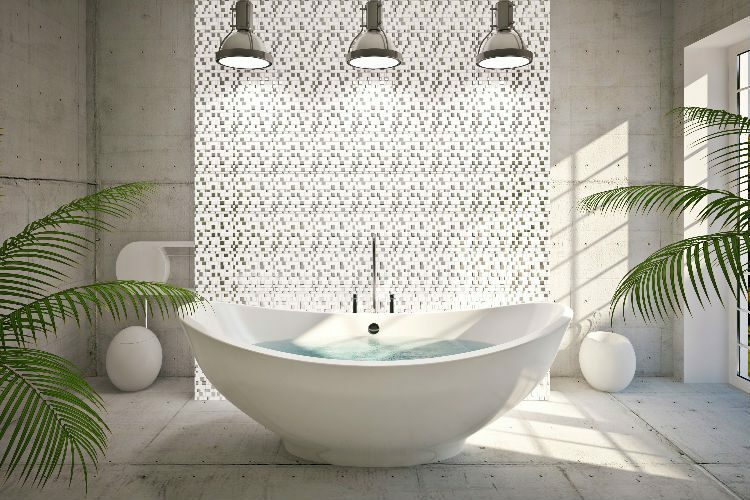 Here’s how to make your bathroom as lively and attractive it deserves to be. Budget style, baby! Blitzing your walls with a new coat of paint is an affordable way to transform the look of your bathroom, and don’t be afraid to experiment with fun colours to really make your space pop. Buttercup yellow, peach pink and mint green are trending this season, but make sure to go for a colour that matches your personality. It’s easy to complement your existing fixtures and accessories (after all, you’re calling the shots), and consider using paint with a satin finish to prevent mildew and mould. The mood is yours to create through colour, style and pattern, so get as inventive as you want! Tiles and grouting! Fascinating subjects to be sure, and a real DIY milestone. If you’ve got some grout that’s looking a bit worse for wear, you can save a fair bit of money by repairing it yourself instead of calling someone in. It’s as simple as a quick trip to your local hardware store and getting your hands a bit dirty. If you want to be a certified grout master, let your grout set for 10 minutes then remix, and add a little water as necessary until it’s the consistency of mayonnaise. Don’t forget to push the mixture into the joints to avoid any air pockets. From shower curtains to toilet seats to bath mats, your bathroom is a highly customisable place. New fixtures can breathe fresh life into your upgraded bathroom, so keep an eye out around the shops for any bargains or interesting bits and bobs. Repurpose some pretty old bottles for your shower gel and shampoo. Decorate your mirror frame. Embroider your towels, experiment with shelving or tie-dye your shower curtain! Embrace whatever makes it ‘you’. Lots of folks are going for upcycled bathroom accessories these days, and many are even making their own. You never know; you could already have the perfect solution for a new bathroom cabinet or mirror sitting right under your nose! Scour your house and garage, or check second-hand stores for quirky products you can upcycle yourself. Not only are preloved fixtures unique, but they save a ton of money that can be used elsewhere. If you are going for the full reno, try to leave the existing layout in place. One of the most costly and time-consuming processes of a bathroom remodel is relocating plumbing, so why mess with it if it’s not broken? You can replace the tub, sink, and any other dated fixtures yourself relatively cheaply, and there are plenty of plumbers and renovation specialists out there who can handle the trickier stuff for you. Got a plumbing problem you need solved? Check our listings for more bathroom renovation experts in your area!